The men’s varsity eight, men’s second varsity eight, women’s second varsity eight and the women’s freshman four shells all won gold medals at the Schuylkill Regatta Oct. 26. Drexel won the overall points title at the event for the fourth consecutive year. Following their impressive performance at the Head of the Charles Regatta, the Drexel crew teams returned to action Oct. 26 for the Head of the Schuylkill Regatta. The Dragons did not disappoint on their home river, as they won five medals in six events en route to winning their fourth straight overall points title. Director of Rowing and head coach Paul Savell said the team really enjoys competing in this event, which is not surprising considering their success. The men’s varsity eight secured first place out of 15 crews in the men’s college and open heavy championship eights final with a time of 13:51.09. Marc Smith guided the Lois Krall shell, which also featured stroke Mikulas Sum, Ivo Krakic, Sebastian Ryan, Nicholas Capaldi, Ian Luetzow, John Pieper, Daniel Palombo and bow Dave Hanrahan. The Dragons dominated the men’s college and open club eights final, as they took the top two spots out of 25 crews. The men’s top second varsity eight in the Antoinette Pennoni boat earned the gold medal, stopping the clock at 13:38.86. The Vince Vidas shell came in second place with a time of 14:06.32. In a race that featured 23 crew teams, Drexel’s men’s freshman eight “A” boat earned a fifth-place finish in the Peggy Greenawalt boat. In the same race, the men’s freshman eight “B” boat took 10th place in the Class of ‘72 shell with a time of 15:16.28. The women’s varsity eight secured a bronze medal in the women’s college and open heavy championship eights final, as the Marlene Buckley II boat stopped the clock at 16:01.98. The women’s second varsity eight shell captured the gold medal in the women’s college and open club eights final, crossing the finish line at 16:18.60. The Maria Papadakis boat featured coxswain Catherine Hamilton with stroke Tori King, Kendall Wenzke, Barbara McKenna, Colleen Delaney, Amanda O’Malley, Alyssa Leahy, Stephanie Thomas and bow Julie McGlynn. The women’s freshman four won Drexel’s fourth gold medal of the competition, crossing the finish line with a time of 18:13.90. The Sandra Lee Sheller boat featured coxswain Nupur Parikh with stroke Hannah Devlin, Molly Dudrear, Emma Cardwell and bow Jenna O’Toole. Savell was happy with how his teams performed and believes that his teams took full advantage of their home course. Drexel alumni also competed on the Schuylkill River. 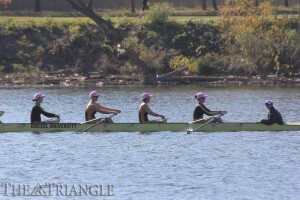 The women alumni came in first place out of 13 crews, finishing at 16:53.18. Meanwhile, the men’s alumni eight took 16th overall with a time of 16:22.49. The Dragons will look to finish out their fall campaign strong Nov. 9, when they will travel to the Cooper River in Cherry Hill, N.J., for the Frostbite Regatta. Savell said he believes the regatta is a great opportunity for his freshmen to show off their progress.